Above the displays, Korins strung bungee-like tension cords in red, white and blue as links leading visitors around. The cords reflect the threads of an American flag. Munoz said that reading Hamilton's private thoughts on everything from his love life and political career to war and even gardening will have a deep effect on his performance. And, especially the details that don't appear in the Broadway show. "Part of the awe for me is how casual so much of this is," said Munoz. He and Korins giggled as they pored over one letter in which Hamilton writes flirtatious words to his sister-in-law, Angelica Church. In response to this article, I feel amazed that they were even preserved that well. I mean, it is Hamilton. But it's so neat they they're selling letters he wrote to his family for that much! $300,000 to $500,000, for of Hamilton's "Pacificus" essays, geez that's a lot for an essay. Maybe they could use it for their own essays ;). Well, that would be plagiarism. In response to "Alexander Hamilton's letters to be auctioned in NYC," I disagree that these letters should be auctioned to the public. One reason I disagree is it is a part of American history and one of our only sources to the American Revolution. Another reason is what will that person who buys it going to do with it, it belongs in a museum. In the article it says "The most valuable item of the auction, estimated at $300,000 to $500,000, is one of Hamilton's "Pacificus" essays. It probes a contentious issue. That is George Washington's declaration of his nation's neutrality in the conflict between France and Great Britain." This proves this should not be sold and if it was many people would try and steal it. In response to "Alexander Hamilton's letters to be auctioned in NYC," I disagree with Hamilton's descendants' decision to auction off his letters. One reason I disagrees is because Hamilton is one of America's founding fathers, and his letters should be in museum so that others can learn more about him. It says in the article "It's sort of like walking into someone's apartment and looking at the desk where they work. And that's so revealing about how their mind works." Another reason is that it just seems greedy to me to auction off his letters. The letters are estimated to be worth between $1.4 million and more than $2 million. I think the letters are priceless and a value shouldn't be put on them. A third reason is that I think some of the letters should be kept private out of respect for his privacy, like his love letters and "flirtatious words to his sister-in-law." 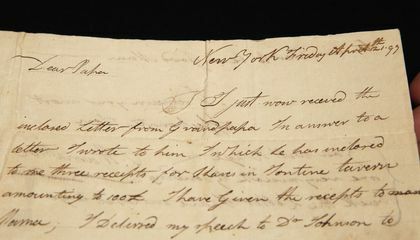 Even though Hamilton's descendants have every right to do what they want with his letters, I think they should either keep them and pass them down from generation to generation or share them with the world by putting them in museums. In response to "Alexander Hamilton's letters to be auctioned in NYC ," I disagree that his letters should be auctioned. One reason I disagree is that these letters could lead up to a new discovery we never knew about. Another reason is that this is apart of our American history we can't just auction it away. It says in the article "It's sort of like walking into someone's apartment and looking at the desk where they work. And that's so revealing about how their mind works" we can't just give away a founding fathers feelings to a random millionaire. I think that the letters should be in a museum, not some random person's drawer. In response to this article, I agree with Alexander Hamiltons decendents choice to auction off his letters. One reason why I agree with this is because he is dead. Many people may disagree with this decision because it's not what he would have wanted, however if he I'd dead, and can't do anything about it. The letters belong to them, therfore they decide what happens. Another reason why I agree with this is because of the fans. The new Broadway musical Hamilton is roaring success. I, personally am a huge fan. I know that anyone like me who religiously listens to the soundtrack and does whatever they can to find any more information to any of the people featured in the production. It would be the highlight of their life to be able to say that they own a letter written by the real man, Alexander Hamilton. The founding father, Alexander Hamilton. The human who lived a hard, inspiring life, Alexander Hamilton. Although these are precious items and they tell these people where they came from, I still support their decision to auction off the letters.